Commencement 2016 marks a particularly historic occasion for four students who will be graduating with a high school diploma and associate degrees in the same year, with Taiyana Allen, Kyrsten Burrows, Dejanee Hill-Edwards, and Sophia Hamilton all displaying great dedication in order to earn the unique distinction. The four students will form part of the Class of 2016 at their respective high schools in June, as well as Bermuda College on May 19, highlighting the success of the Dual Enrolment initiative at Bermuda College. 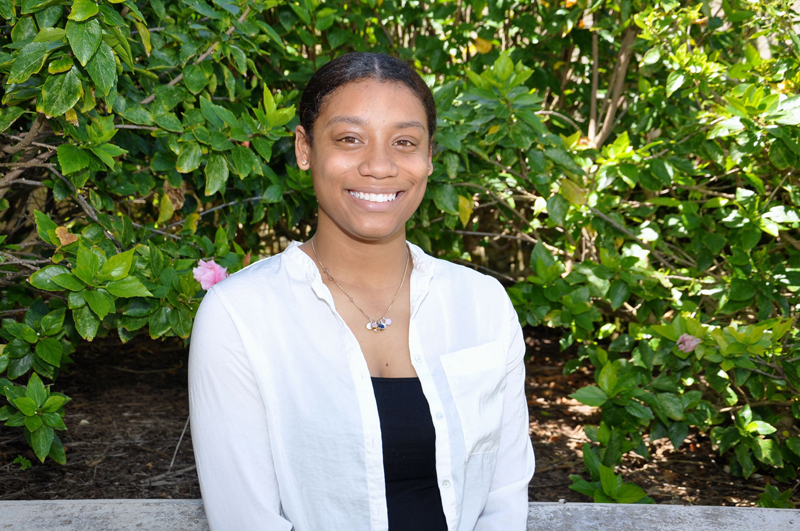 In the first spotlight of these exceptional students, we look at Dejanee Hill-Edwards, who attends both the Berkeley Institute and Bermuda College, and recently received acceptance from St. John’s University into their Accounting program for the Fall 2016 semester. Outside of her academic endeavors, Ms Hill-Edwards has also participated in different volunteer work within the community. “One of my main volunteer focuses was through the Junior Volunteer program at the Bermuda Aquarium, Museum, and Zoo; where I still volunteer when I can,” she said. “There, I worked in various departments developing key skills such as time management, organizational, observational, and interpersonal skills. I also gained a different understanding of the world around me and the importance of preserving the environment. “In addition, I have also worked with other organizations such as Tomorrow’s Voices; assisting at one of their annual events, Bounce for Autism. “Another approach I undertook to aid in enhancing the community was when I organized community service projects whilst serving as Treasurer on the Executive Committee, as a member of Cohort 9 of the Mirrors Program. The community service project was a fun day held at Clearwater Beach where the aim was to bridge the gap between generations within the community. “This was a successful event, in which funds were raised to donate to SCARS, a charity that deals with domestic abuse amongst women and children. “Community service and volunteer work has taught me the value of working together to accomplish given tasks or projects. In every capacity of volunteer work I have undertaken, at some point, I had to either work cooperatively on a team or with an individual. Learning how to cooperate alongside people helped me gain imperative insight into a topic or task which made the difference on whether or not things were accomplished successfully. “Extracurricular activities have also played a major role in my school career thus far. In previous years, some of the extra curricular activities I participated in ranged from track and field, sailing, Duke of Edinburgh, and band; however, I have recently been involved in a select few of extracurricular activities. These activities include Stage Manager for The Berkeley Arts Dept, and Youth Parliament Bermuda. “Youth Parliament Bermuda has been my main extracurricular activity for the past three consecutive years. At Youth Parliament Bermuda, I was appointed Youth Premier in my second year, and my current position is Youth Speaker of the House. Within Youth Parliament I represented Bermuda at conferences and debates in London, UK and Barbados. “Youth Parliament Bermuda has arguably taught me the most about the community and myself. It has challenged my leadership capabilities and allowed me to express my opinions on local issues that affect the youth. I have realized the importance of having a voice and letting that voice be heard. I have also realized the value behind networking and the opportunities you can gain from it. “Tying into the leadership experiences I outlined from Youth Parliament Bermuda as Youth Premier and Youth Speaker of the House, I have encountered numerous occasions of leadership experiences during my school career. I am currently the Deputy Head Girl at The Berkeley Institute and serve on my school’s Prefect Council. “I have received awards, both from school and the community for my leadership abilities, such as the Mirrors Program Leadership Award. Recently, I was nominated for the category of Leadership for the annual Outstanding Teen Awards. “Within The Berkeley Institute Arts Dept., I have served as an Assistant and Stage Manager for multiple productions including the most recent, Peter Pan, leading a stage crew and organizing on and off stage affairs. “One critical aspect I have gained from these experiences is that as a leader, you will face many obstacles and challenges that you will have to overcome; however, it is how you deal with those challenges rather than the outcome that is recognized and noted. “Currently, I am working diligently towards achieving my future career aspirations. My utmost goal is to become an Underwriter. To achieve my main goal, there a other goals that are put in place to help me achieve the objective. “This includes obtaining a Bachelor’s Degree in Accounting and then continue with my Masters Degree in Risk Management and Insurance.Upon my completion, I will enter the workforce where I will diligently work towards obtaining several designations which include, but are not limited to, the CPA and or the CPCU. Overall, I want to enjoy and be successful in any field that my academic path leads me. When asked how she became involved in the Dual Enrollment Initiative, Ms. Hill-Edwards told Bernews, “I first became involved in the Dual Enrollment initiative when Thaao Dill and Ms. Necheeka Trott presented it to a group of students at my senior school at the end of our S2 year as a way to receive college credit in order to compete with students enrolled in programs such as the IB. I started the program the following year [S3]. “It took a tremendous amount of hard work and dedication in order to complete both programs at once. At times, it wasn’t easy having to balance and organize myself around my classes at Bermuda College as well as my classes at Berkeley; especially during critical periods at Bermuda College such as finals week. I had always to remain focused and keep in mind what I wanted my end result to be. When asked where she hoped her education would take her professionally, Ms. Hill-Edwards said, “I know that Bermuda College has prepared me well to transition off to university abroad [St. John’s University in NY] where I will study Quantitative Risk and Insurance. This will lead me towards achieving my ultimate career goal, an Underwriter. “I have to give a huge thanks to the educators that have supported me throughout my journey from Paget Primary, to Sandys Secondary Middle School, to The Berkeley Institute. Without their influence and guidance, I wouldn’t have achieved as much academic success as I have. “I cannot express enough how much I appreciate the support of my family and friends that have been there to celebrate my success and encourage me to do better during those challenging times,” she added. Congratulations! You look just like your old man. such an amazing and talented young lade…I wish you all the success this world has to offer. Dajanee Hill-Edwards….you are a shining star. May God’s richest blessings be bestowed upon you as you embark on your academic overseas venture.You are exemplary, and students should follow your outstanding lead. Dejanee Hill-Edwards you have always been an exceptional individual. One who has never been afraid to soar. However, I want you to know that it is through your humble attitude, dedication and commitment that you’ve reached this milestone in your life. I pray that you will continue to be open to receive GOD’s blessings for your life as HE continues to guide you. Well done and I always knew that you were exceptional.